Writhing, tentacle-covered monsters of the sea, wildly-thorned creatures with gorgeously and gruesomely exposed organs, street-stalking, multi-faced aliens: the stuff of nightmares for most. But these are just a few of Leeroy New’s favorite things. 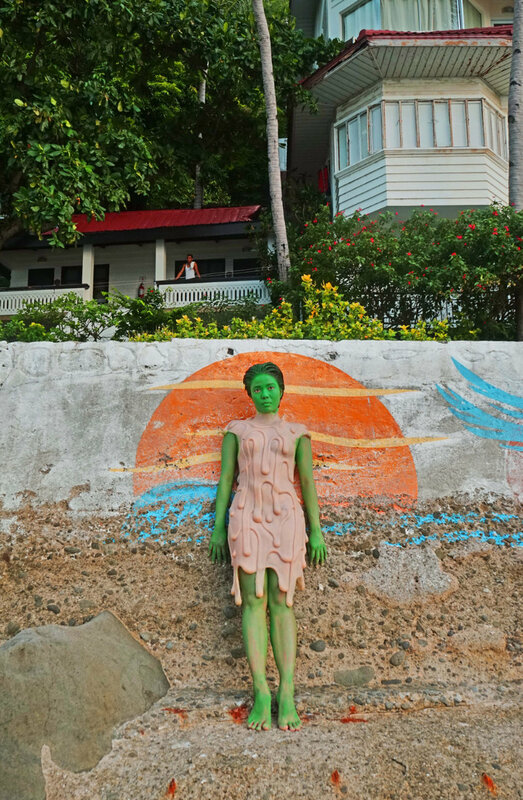 The far-out, Philippines-based artist dabbles in a number of mediums: he’s worked on production design for film, with fashion designers, even created 3D mock ups for commercial purposes. 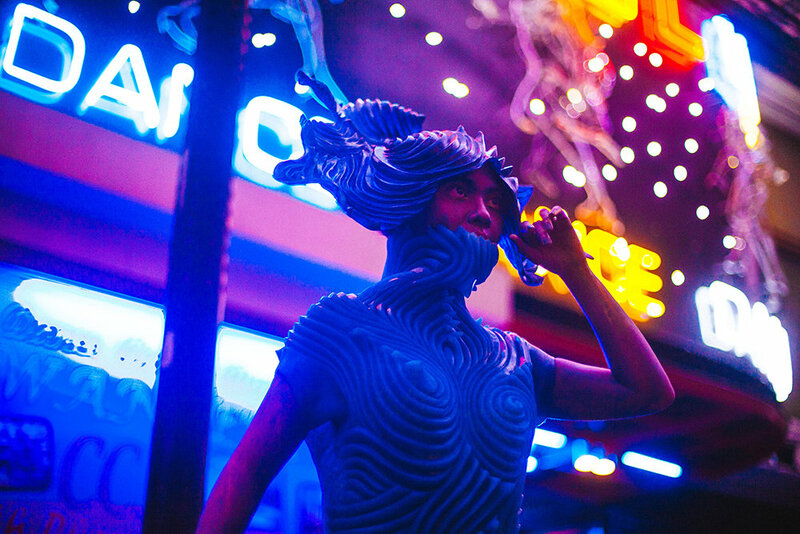 He's exhibited at the Singapore Biennale (2008) and the Fukuoka Asian Art Triennale in 2009, and once created wearable, sci-fi inspired art for Lady Gaga. But it was his move to the challenging world of large-scale public art that led him to these particular creatures. 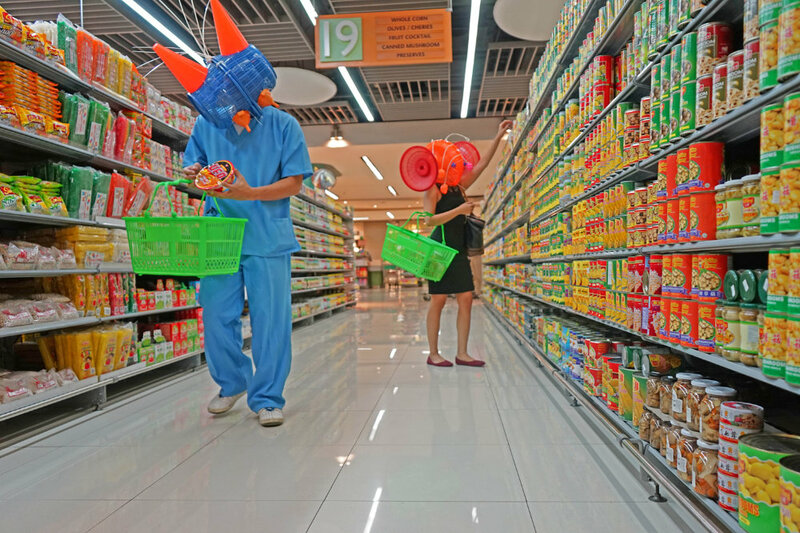 With Aliens in Manila, New looks to give form to the abstract and unreal, giving voice to the absurdity and contradictions of our modern world - more particularly of Manila. The artist creates wearable art pieces constructed from found objects, transforming regular humans into creatures or aliens from our wildest imaginations. Then he snaps them wandering the streets of Manila. Wild, whimsical, beautiful, grotesque: his creatures give a whole new meaning to Thrilla in Manila. In an interview with Globetrotter's Bere Wangge, New talked inspirations for Aliens in Manila, the evolving art scene in his fair city and what else he's got in the creative pipeline. Read on for the chat. Globetrotter Magazine: Let's start from the start: how did Aliens of Manila come about? Leeroy New: To be honest, it started as a joke during one of those drunk nights with friend-collaborators. We’re obviously referencing that hugely popular Humans of New York but at the same time questioning the ‘humanity’ of our subjects within the context of a precariously developing Philippines. I work a lot with performers and filmmakers and this seemed like just a very natural expansion of the collaborative nature of our individual practices. Globetrotter Magazine: What do these creatures represent? And why did you choose Manila? Leeroy New: My work has always been described as sci-fi or monstrous or otherworldly and I’ve always just positioned this inclination for the “alien” as part of the eternal human desire to give form to the unknown or the abstract and unreal as a tool for comprehension. By juxtaposing these real people in absurd costumes against the backdrop of urban Manila, what comes out for me is the incongruence or even the alienation of these characters from their environments and social conditions. Globetrotter Magazine: In a past interview, you mentioned that the aliens often represent people you've met or you know. Tell us more about that. For example, if there was a particular person who inspired you, how did you translate them into one of the creatures? Leeroy New: Aside the from the fact that the performers/models in costume are my friends, the captions are usually sourced from them as well. It’s a collection of reframed experiences, thoughts, and even aspirations of the urban landscape’s inhabitants. The idea for the mother and child alien in the white ‘heads’ dress, for example, came up organically because I’m the godfather of the child model and we just decided quite organically to have her participate in the shoot. Globetrotter Magazine: Tell us about the creative and physical process of creating the aliens. Leeroy New: The costumes kind of become the starting point for the characters because the costumes themselves are a response to what is available. These costumes are usually made from an assortment of materials usually sourced from Divisoria, which is a market district in the heart of the city of Manila where you can buy just about anything. Then the performer-models simply inject their own reading of the character based on the costumes they are wearing and in relation to the location of the shoot. Globetrotter Magazine: For those who are totally unfamiliar, what's the art scene in the Philippines - and particularly in Manila - like? Leeroy New: The scene is very diverse. 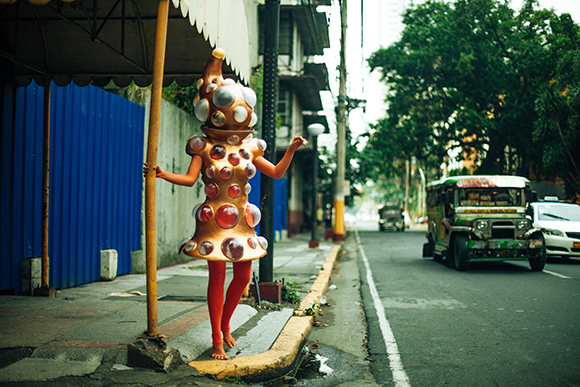 Manila is a densely populated region and creative practitioners come from all walks of life with just as many different and differing aspirations. Globetrotter Magazine: What do you have in the pipeline for next projects? Leeroy New: I do mostly site-specific installation projects with a tendency to overlap with performance and community activation. A current project of ours is the rehabilitation and development of the currently very polluted (it’s actually considered dead by ecologists) and ignored Pasig river, a once important transport route and source of water that cuts across the capital of Manila, via art and design strategies. Initially we’ve finished the first phase of a floating sculptural island and recently launched a call for artists to paint the flood stations that are sporadically positioned along the length of the river. We hope that by injecting some kind of creative identity to the river, some much needed shift in urban development will take place. Bodice won the 2017/18 International Woolmark Prize in the Womenswear category. According to Netflix, at least. There's a new wave of euphonic talent revolutionizing Nigerian music with sounds that go beyond just the country's famed Afrobeat. Alongside exploring the different sides of her identity, 21-year-old multidisciplinary artist, Ejatu Shaw reveals consequences of refuting religion.